A few days back, Lisa at Polka Dot Creations invited us to explore her polymer clay toolbox. She showed several of her handmade tools and asked for folks to share their own ideas. What It's Good For: Original use? Smoothing skin. Polymer clay use? Adding texture. The organic look and random patterns of the pumice stone make it wonderful for texturing polymer clay. 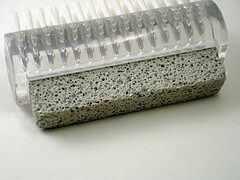 How to Use It: Use the pumice stone on an uncured sheet of polymer clay. Press into clay to create a rough texture that's ideal for nature-inspired pieces and certain baked goods. Where to Find It: Your bathroom. Inexpensive gift sets on after-Christmas sale. Beauty supply stores. Amazon. Similar Ideas: Pumice is just a type of volcanic rock, so if you have lava rocks in your flower garden, give those a try. You could also use a Loofah sponge, since it has a similarly organic pattern. Next time I'll show you another re-purposed tool, this time from the kitchen. Til then, be sure to check out the comments on Lisa's posts for links to other crafty tool ideas. Oh, what a great idea Angela! You can also use the brush you have on the other side of the pumice stone for texturing as well. Two tools in one! You're absolutely right, Cindy. This particular brush has pretty firm bristles, so it gives a more pronounced texture. Very useful, though! A huge number or people believe betting is simple a lucky game meanwhile it's a true science. Guys who seriously dream to be a pro should start reading informative articles like this one.